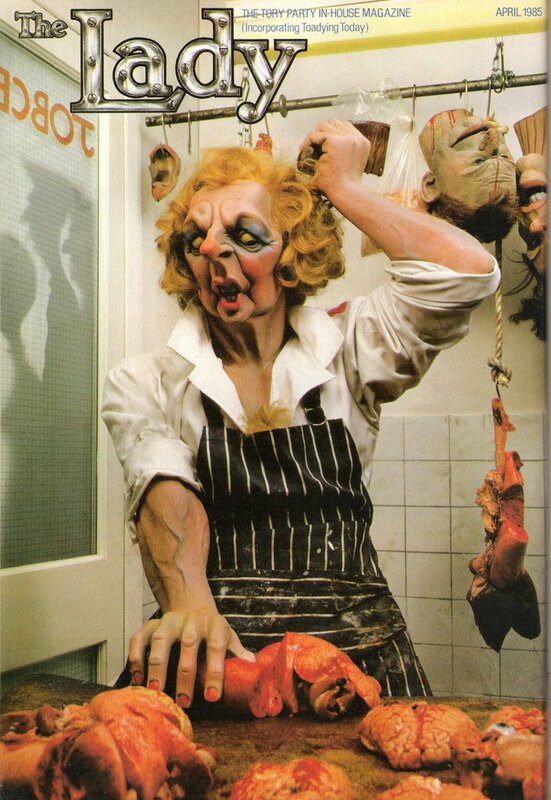 Anyone old enough to watch television after the watershed in the UK during the 1980s will undoubtedly remember Spitting Image, the political satire programme which had an audience peak of fourteen million. It was a brilliant concept, born at a time of huge political divide in a country where the young were politically active and workers of all backgrounds engaged in debate. There were clear differences between the parties, its leaders and MP’s and for writers and producers like Peter Fluck, Roger Law and Martin Lambie-Nairn the material was gifted to them every week. The programme was based on grotesque puppet characters of the leading politicians of the day, their mannerisms, whilst clearly exaggerated never failed to strike a nerve and could often cause a politician considerable damage to their reputations. The SDP-Liberal Alliance was portrayed as a tale of two leaders, the wimpy David Steele who wet the bed and was treated as a ‘Judy’ to David Owens ‘Punch’ to such an extent that the pair discussed what could be done to change the public perception Spitting Image had created of them. Labour didn’t fare much better with leader Neil Kinnock as ‘The Welsh Windbag’ whilst his deputy, Roy Hattersley sprayed spit with every sentence. But it was Margaret Thatcher who, as the Prime Minister of the 1980s was the star of the show. In the series she is a cross-dresser who behaves like a man whilst her cabinet pathetically fawn around her with Norman Tebbit appearing as a skinhead who uses force to implement her wishes. For the first three years of its life it was produced by John Lloyd who had produced the ground breaking ‘Not The Nine O’clock News’ for the BBC. Lloyd would later recall that given the levels of animosity felt towards the Thatcher government at the time both programmes were destined to work. They did, and the brilliance of Spitting Image in those early years was its ability to entertain as well as engage. Would it work today? I doubt it. The political arena, with the exception of Farrage has become to sterile for a politician of character to survive and the lack of political comedy on our screens is a sad testament to our faceless politics and the inherent lack of interest in it, particularly with the youth.